Rebecca Mills and her family were driving home from Granite Gorge Nature Park in Australia after a successful camping trip, feeling very relaxed after their little vacation — when they suddenly noticed they weren’t alone. 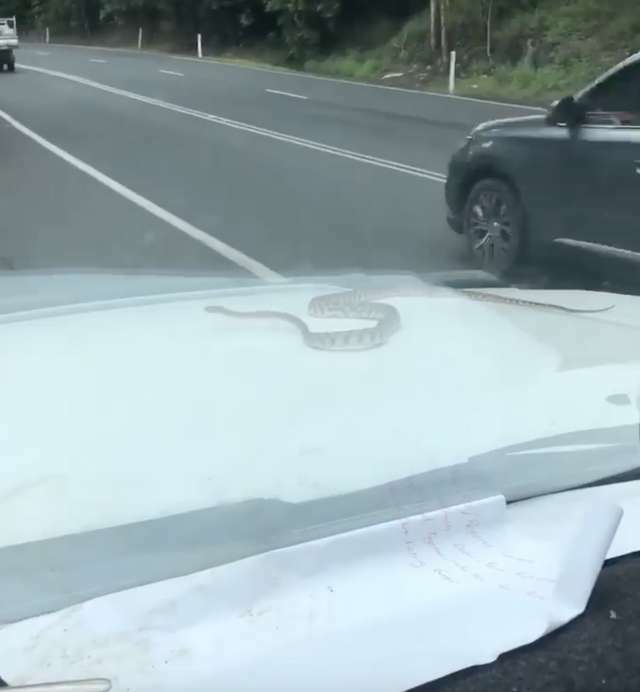 There, on the front of their car, was a snake, just casually hitching a ride. “You’ve heard of snakes on the plane ... well we had snakes on the range,” Mills wrote on a video about the encounter. 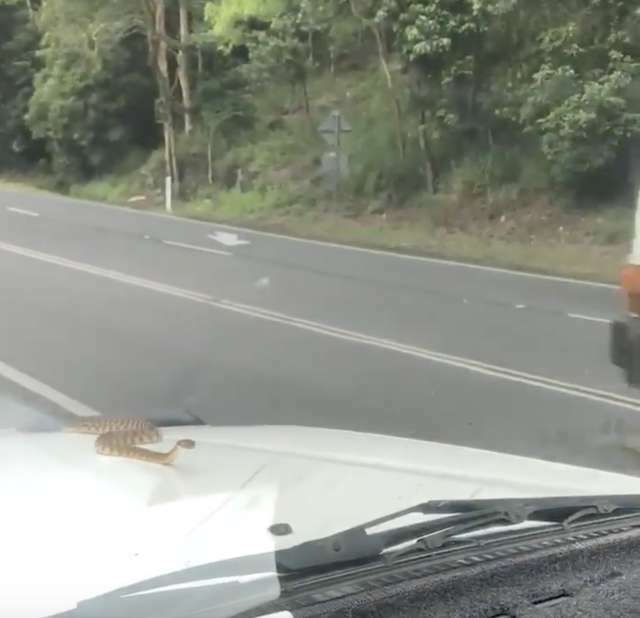 While the entire family was very alarmed by their little hitchhiker, the snake seemed pretty unfazed by the whole thing, and just casually lay there, bobbing around in the wind. 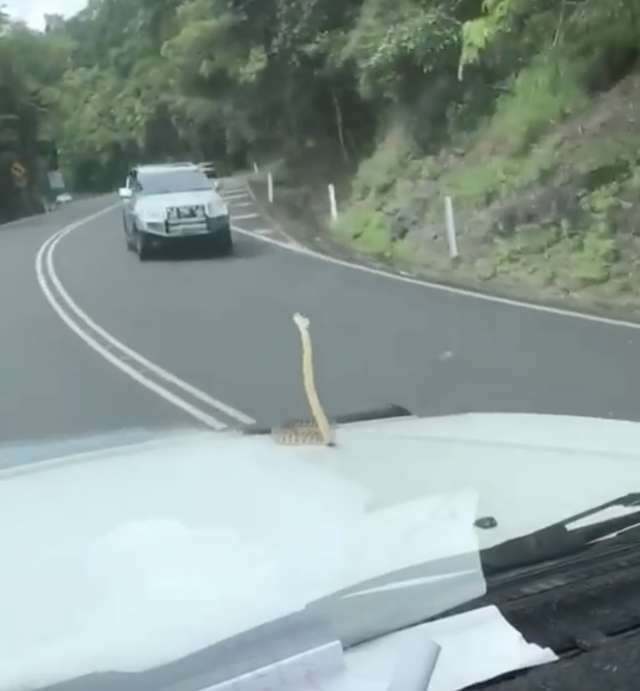 As the snake hung out on the moving car, the family yelled and carried on, trying to figure out what to do. Mills’ husband David joked that the snake was his pet now, while their daughter was much more terrified of the whole situation. “With nowhere to pull over, we were forced to drive for quite some time while we looked for a place to pull over,” Mills told ViralHog. … and as soon as they stopped the car, the snake slithered toward the windshield, causing everyone to freak out again. 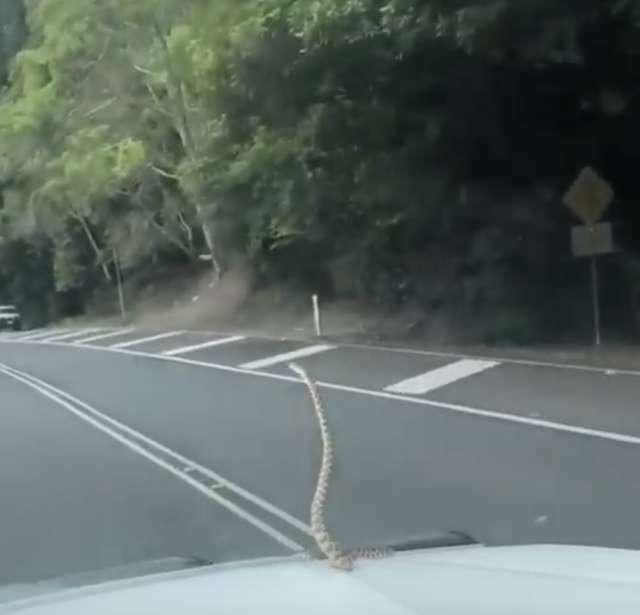 Eventually, though, Mills’ husband was able to get the snake safely off of their car and onto the side of the road, where he slithered away into the forest, safe and sound. The family was then able to get on their way again, hoping that they wouldn’t run into any more hitchhiking snakes. The video is pretty hilarious. It would've surprised me. Northern N.J. --- timber rattlesnakes. "So he reached down to "adjust" the snake. " "Honorable Mention status for The Darwin Awards." Yes..Glad to see some appreciation here. "Asps. Very dangerous. You go first"
1. That happened to me. It slithered across the windshield and wound around the driver's outside mirror while my child and I screamed. I was on the entrance ramp to a major highway; so I couldn't pull over. The snake kept winding around the mirror and finally blew off onto the road behind me. A huge commercial truck ran over both his head and tail; he was that long. I just hope it never happens again. 13. Northern N.J. --- timber rattlesnakes. I encounter them on trails every few years. They are not aggressive. There is a nest that is 15 ft. off the side of the Appalachian trail. A few thousand people pass the nest each year on their hikes - without incident. They are endangered and protected. Only one person was bit in the last 30 years, that I know of. He was hiking in the Delaware River National Park and encountered the snake. He wanted to take a photo of the snake but the snake was in a position not favorable to a photo in the Sun. So he reached down to "adjust" the snake. For his trouble, he spent a few days in hospital and got a $2k fine. 14. "So he reached down to "adjust" the snake. " That right there is weapons grade stupid..
at least Hoinorable Mention status for The Darwin Awards. 17. "Honorable Mention status for The Darwin Awards." Especially prevalent in my home state of Floriduh.... I think this phrase was coined here..
18. Yes..Glad to see some appreciation here. Happy, too, that our friend, the Snake Adjuster was an Honorable Mention Only, given the high price of a "win". Snake seemed to like his ride. Didn't want it to end. think I'd do a lot of camping. Heck I might not even take a step outdoors. But the dad was cool. He just hops out, fetches a stick and flicks the joyriding snake towards the woods. "Oh crikey, it's just a tree snake"
put a Corvette into a canal along Alligator Alley when I swerved to avoid driving over a snake. I just knew it would come up through the floor and get me. As the snake hung out on the moving car, the family yelled and carried on, trying to figure out what to do. 9. Snakes. Why did it have to be snakes? 10. "Asps. Very dangerous. You go first"
looking at these pictures, I get the sense that this snake may have done this before! Sure looks like it's diggin' the ride like a dog hanging its head out the window. I get them in my shop, Garters and Milk snakes almost stepped on one while working last summer I try to catch them and put them outside again but a lot of times they get away under my lumber pile they are not poisonous good for rodent control. If I discovered a live snake inside my car I really think I'd stroke out and shat myself. ... but instead your car comes along, and they hitch a free ride. I don't think it's dangerous though, the snake is probably just as scared as you are.